The priority of GMB Scotland is always the defence of our members’ interests. Over the last year you have worked, marched and ultimately sacrificed to help ensure the continued delivery of Scotland’s renewables infrastructure. I believe that in the years to come, your work-in will prove a watershed moment for employment in the renewables manufacturing sector. But I understand that it’s hard to see the positives at this moment in time. The present situation is painful. Yards are closed and livelihoods have been lost and displaced. The people who did the most to keep BiFab viable were rewarded with a P45. That some of the people who ran the old company into the ground are still in the employ of the new company hasn’t been forgotten by GMB. However, we know this is a long game and that’s why we have been campaigning relentlessly to ensure that when work returns to Fife and Lewis, which it will, we will build a sustainable future. Since the purchase of BiFab by DF Barnes / JV Driver in April, it is fair to say that our relationship with the Canadian firm has been turbulent. Respect and trust has to be earned and nurtured but our relations with DF Barnes / JV Driver are improving and we believe that they are serious about a long-term future in Scotland. 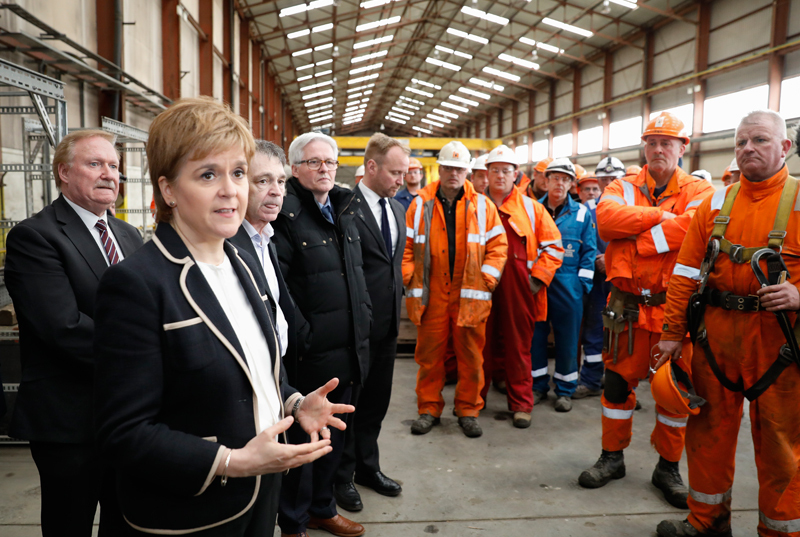 GMB Scotland will not allow the Scottish Government or the Canadian owners to forget the struggle and sacrifice you made to give BiFab a future. We now know that BiFab has been short-listed for major renewable manufacturing contracts which could help get the yards back off the ground and work in the door. It is in everyone’s interests that BiFab is successful but we don’t want a return to ‘feast and famine’ manufacturing at BiFab. We need sustainable and secure employment and opportunity. This is where trust will be tested. We have told the new owners what we will judge them on: Steady contracts; community investment; employment standards; apprenticeships; and trade union rights. What will also become clear in the years to come is that the promises made by politicians a decade ago over Scotland’s renewables industries will amount to nothing more than a puddle of snake of oil. Today we don’t have the ‘Saudi Arabia of renewables’ we were promised; just three fabrication yards that are closed and an industrial / political strategy that can’t command any more than crumbs from its own wind farm industry - one of the biggest on the world. Scotland could and should have a flourishing renewables manufacturing sector but the fact is these massive energy projects are funded and delivered by a spaghetti bowl of international competitors. Meanwhile, the taxpayer pours billions of pounds of subsidies into an industry that lines the pockets of other countries and private financiers, instead of redistributing wealth into our own communities. This is what political failure looks like both at Holyrood and Westminster – neither has clean hands in this scandal. The DF Barnes / JV Driver purchase, along with the Scottish Government investment, is a chance for a fresh start in Fife and Lewis but the days of billions of pounds being pumped into the Scottish renewables sector, with no questions asked, needs to stop. The great renewables rip-off must end. We will know whether BiFab has been successful with their bid for the Moray East work at the end of September. I just wanted to assure you that your union is straining every sinew to try and secure work for the yards in Fife and Arnish. We are not giving up on the Battle for Bifab. On Wednesday 6 June, the Joint Trade Union representatives of GMB and Unite, met with the senior executives of DF Barnes / JV Driver at the Methil yard. It was the first time the Canadian management team had met us since they took a majority stake in BiFab. After the appalling way the redundancy announcement last month was handled, we went in to the meeting hopeful that lessons would have been learned and that the senior executives would be prepared to engage with the unions in a meaningful way. We hoped that there would something positive to say about the future of the 3 yards. The executives from DF Barnes talked at length about the experiences of the company and the positive culture in their business. They also advised us that there was a large amount of effort going into winning new contracts that will secure the long-term future of the yards. However, the reality is that there is no work coming to sustain our ‘core’ staff in the short-term and as far as they are concerned the redundancies will be happening. What we were offered amounted to nothing more than a promise of ‘jam tomorrow’. In the meantime, our members will be whittled down to a small team who will carry out very basic maintenance as well as the apprentices. On the other hand, senior management will be retained. Frankly, we consider this an injustice. The people who campaigned to save these yards and whom we have been told are BiFab’s biggest asset will be sacked while some of the people who helped run company into the ground being kept on the payroll. Against the backdrop of significant taxpayer support for DF Barnes / JV Driver and with so much to be done to get the yards cleaned up and fit for the future, in our view money should have been found to retain more core industrial staff. The engagement from DF Barnes / JV Driver with the trade unions has been poor. We have been kept in the dark whilst livelihoods have been lost. There is clearly no understanding from the Canadian Senior Executives about the role the trade union have played in keeping the yards open. Their attitude has been pretty contemptuous toward the unions and that isn’t acceptable. We understand that there is no work in the yards and it is a tough position but DF Barnes / JV Driver have done very well out of the Scottish tax payer, they are not here out of the goodness of their hearts. As such they will not get a free ride from the trade unions. In the coming days your Convenor will be talking to you about the situation and how we will confront it. Wherever this ends up and whatever course of action we decide to take, we will not be found wanting. The following statement was issued today by the Joint Unions. "When the company fell into trouble last November, we called on everyone to pull together and battle for BiFab. "Work still needs to be done but we hope today's deal is the start of a bright future for our members and their families. "Let's be clear that this would not have been possible without the determination and solidarity of the workers and their communities and of course, the continued efforts of the Scottish Government and their staff in securing this investment. "We look forward to meeting with the new owners as soon as possible, to learn of their plans and to help secure the necessary contracts that can help deliver prosperity for Fife, Lewis and Scotland." As you will be aware, BiFab management issued a formal notice of redundancy to workers across the company this morning. This is a statutory response to the time-scale left between now and Saturday 31 March, the scheduled date of completion for the Beatrice contract work. Although expected, I appreciate this will increase anxiety among members while negotiations between the Scottish Government, the company and new investors continue. In the meantime, it is imperative that the scheduled contract work continues as normal. What this morning’s notice should do now is increase the urgency for a successful outcome to these negotiations. I will be in Fife tomorrow and in Arnish on Wednesday for meetings with your GMB reps and with BiFab management. Joint Trade Union representatives will meet again next week with the Scottish Government where we expect to be given an updated position on the future of the yards from the Cabinet Secretary, Keith Brown MSP. Our message going into that meeting is clear: Time is of the essence to save your jobs, yards and communities. The objective of GMB Scotland in everything we are doing is geared towards securing the future of Arnish, Burntisland and Methil. Please be assured that your trade union is doing everything we possibly can to defend your interests at this time. The Battle for BiFab is a crossroads moment for Scottish manufacturing and the Scottish economy. But it’s not just about jobs and skills. The yards in Arnish, Burntisland and Methil support families and communities. They provide opportunity for all. We are told time and again that these are the jobs of the future. So we urge all stakeholders and politicians: Don’t let our members’ livelihoods become a thing of the past. Listen to the people. Letting these workers and their communities go under is not an option. We need to pull together and Battle for BiFab. Please click on the image below or this text to watch the video. Since the weekend’s developments, I cannot imagine how hard the situation has been for you and your families. I will always be really honest with you. I cannot guarantee that we are going to get a successful outcome to this fight. The situation is really tough and you know that. But I will say this; if you had not taken the stand that you have the yards would already be closed. The fight you and your reps on the Joint Trade Union committee are undertaking gives us hope and sends the strongest possible message to politicians and private stakeholders that you are fighting for your livelihoods. It is vitally important that we keep your struggle in the public and political domain. This is the best chance we have to get the big commercial interests involved to do the right thing and it is the only hope we have of getting the leadership this crisis needs from the Scottish Government. Tomorrow (Thursday 16 November) we will head to the Scottish Parliament and call on all politicians, parties and the public to stand with us and battle for BiFab. The demo will assemble from 10AM at Johnston Terrace, leaving at 10.30AM to march down the Royal Mile to the Scottish Parliament. From 11 AM we will lobby outside of the Scottish Parliament. You can also email our dedicated campaigns email - gmbscotcampaigns@gmb.org.uk - or call in our Glasgow Office on 0141 332 8641. Absolutely everything we can do is being done and every resource we have will be made available to support your fight. You will appreciate that the situation is developing all the time and we will do our best to keep you advised of developments. I stress that I will always be honest with you. In times like this I know you want all parties to cut through the bluster and get to the truth. That’s what we will also endeavour to do for you. Our absolute priority is the defence of your interests – your job, your family, your industry and your community. You have shown great dignity is this fight so far. Your solidarity is magnificent.